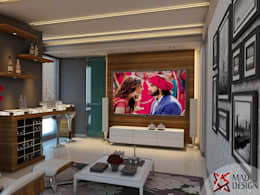 A beautiful and comfortable home in Greater Noida! 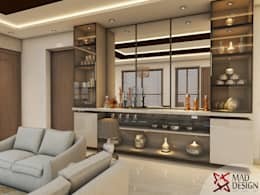 Home / MAD DESIGN PROJECT STORIES / A beautiful and comfortable home in Greater Noida! This home brings to mind three words: contemporary, balanced, comfortable. 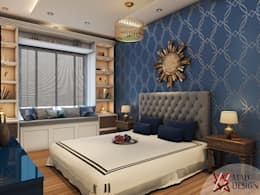 The design is exquisitely designed and executed by Mad Design Interior Designers for an apartment in Jaypee Greens Golf Course and speaks of the home owner’s desire to be surrounded by comfort and elegance. The interiors are done predominantly in pristine white with wood and gold overtones in places. It is a home where everything is perfectly balanced, much like the art frames in the living room. It is a home worthy of the home owner’s pride! The home theatre area is a dedicated space with wood panelling and cove lighting. A mini bar with trendy bar stools and ledges provides for an inviting look to this space designed to relax with family. This is a chic and modern living room with leather sofas and recliners and a trendy white coffee table. A white and grey rugs adorns the floor while a white and grey wall paper converts the wall into an accent wall. A wood display shelf breaks the monochrome pattern. While the living room was contemporary and stark, the dining area is more ornate and regal in character. The mirror on the wall is an interesting touch. 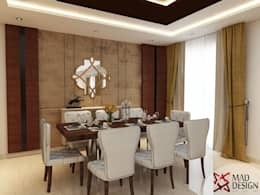 The white leather chairs are in keeping with the overall design of the house but the wood panelling and textured wall along with the plush drapes sets the living room apart as a distinctive area on its own. This is a kitchen that is artistic in character with its rich wood panelling and the interesting lamp shades. 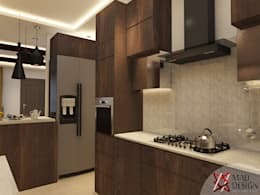 The laminated look of a modular kitchen is avoided with the dark wood finish. The patterned tiles on the wall also gives it an appealing look. The gadgets are conveniently housed in cabinets. The hob and chimney sport a modern design. This bedroom is an interior design enthusiast’s dream with its smart décor and artistic touches. The outstanding feature of the room is the accent wall in blue which is highlighted with the use of a bronze artefact. The chandelier is light and modern. A window seat makes for a comfortable corner to relax or read. The bed is in a contemporary design with an interesting headboard. This bathroom completely turns on its head the idea of simple bathroom. 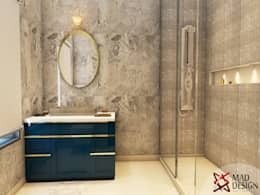 The wall tiles, the elegant blue and gold dresser, the oval shaped mirror with brass edges and the glass shower area are all meant to reflect taste and elegance, making it a space to truly relax in at the end of a long, hard day.